Night gowns During The Winter Months - As autumn draws to a close and the nights are colder, lingerie enthusiasts and newbies are naturally drawn to cozy sleepwear. Ideal for sleeping and lounging while binging on your Netflix favorites, long nightgowns and snuggly sleep shirts in flannel, brushed back satin, and fleece are some of the best choices for keeping warm when it matters most. When it comes to the perfect blend of silky satin sleepwear that’s luxurious and cuddly soft, brushed back satin nightgowns and nightshirts are a classic pick that tick all of the boxes. With an outer layer of traditional shiny satin, and an inner layer of cushy brushed cotton designed to hold body heat, this popular winter nightwear fabric is a great way to stay toasty warm in stylish comfort. Developed for the sleepwear industry and sought-after for its super soft flannel-like feel, this medium-weight woven polyester fabric is also referred to as cuddleskin. Brushed back satin nightgowns come in an array of loose fitting pull-over styles, with long sleeves and trim options that often include lace detailing, pin tucking, rusching, and embroidery. Tip – Keep in mind that brushed back satin is a woven fabric that does not stretch. 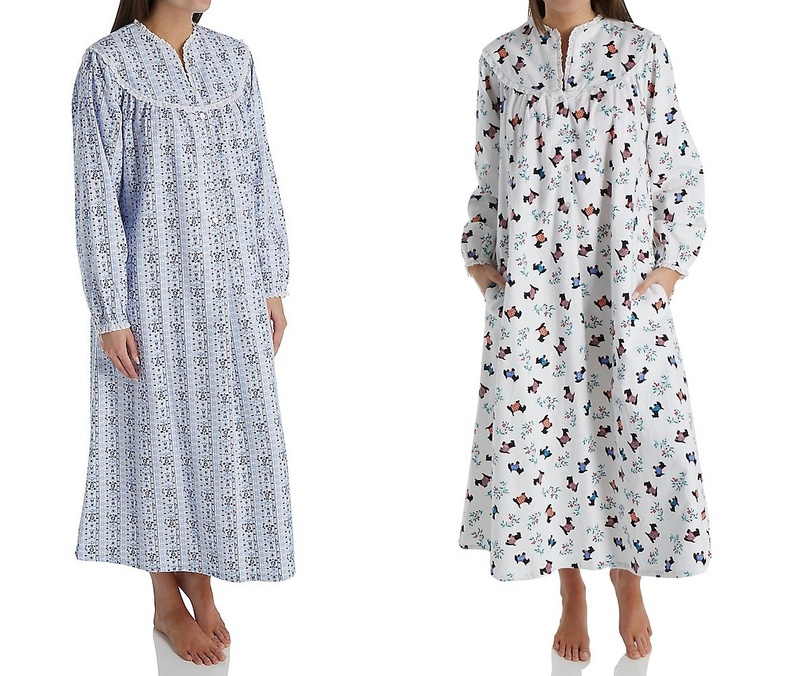 For a more comfortable fit that offers a greater range of movement, you may want to opt for slightly larger night gowns during the coler months. Whether you’re in the middle of a -40 degree blizzard in Minnesota, or an exciting eco-adventure in Antarctica, thick fleece is a go to women’s sleepwear favorite that’s designed to be comfy and warm no matter how cold it gets. Originally developed for outdoor enthusiasts, from hiking and mountain climbing to deep sea diving, fleece continues to be a popular choice for colder temperatures. 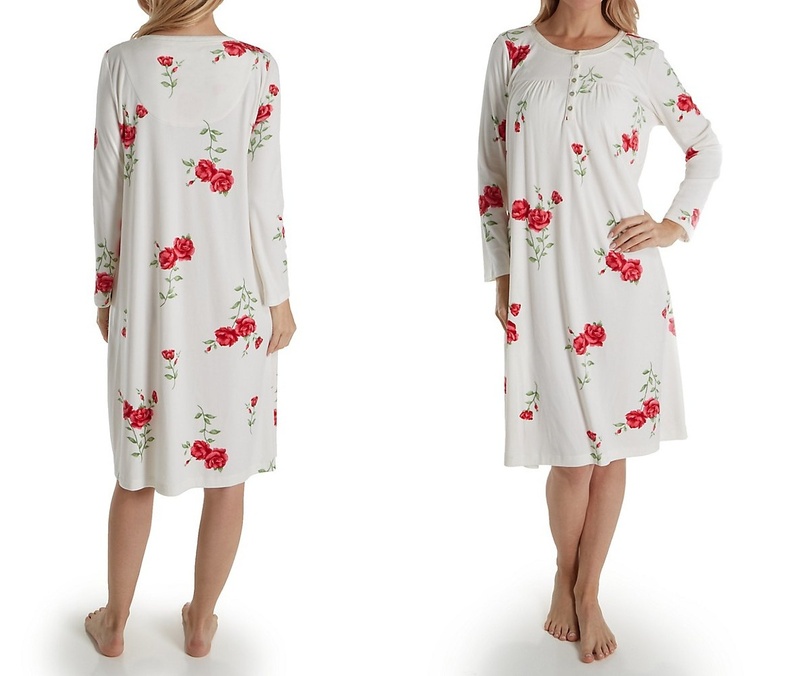 Offering the same thermal qualities as fine quality wool in a much lighter weight, soft and fuzzy polyester fleece is a moisture resistant synthetic fabric that’s an ideal choice for super warm nightgowns and popular sleep shirts. Adapted for the sleepwear industry, tried and true basics in fleece sleepwear include nightgowns, pajamas, and robes in a surprising variety of fabric weights and textures that range from popular anti-pill and uber soft micro-chenille to playful novelty fabrics. Tip – soft and plush fleece nightgowns and sleepwear are available in bright colors, exciting patterns, seasonal themes, florals, stripes, and prints that make great gifts for family and friends, especially during the holiday season. With origins that date as far back as 16th century Wales, super cozy soft flannel nightgowns are the unspoken grande dame of warm nightwear. Synonymous with Hollywood blockbusters like The Sound of Music, the snow-peaked alps of Austria, and relaxing nights in front of a roaring fire with a frothy cup of cocoa, flannel sleepwear is a popular choice for all ages. Well known for its its instantly recognizable tartan and plaid patterns, and signature Tyrolean prints, flannel is made from tightly woven cottons and synthetic blends, and comes in a range of weights for comfortable nightwear. From baby soft flanelette and popular cotton flannel to the little known eco friendly vegetable flannel, this sleepwear fabric is specially designed to retain heat. 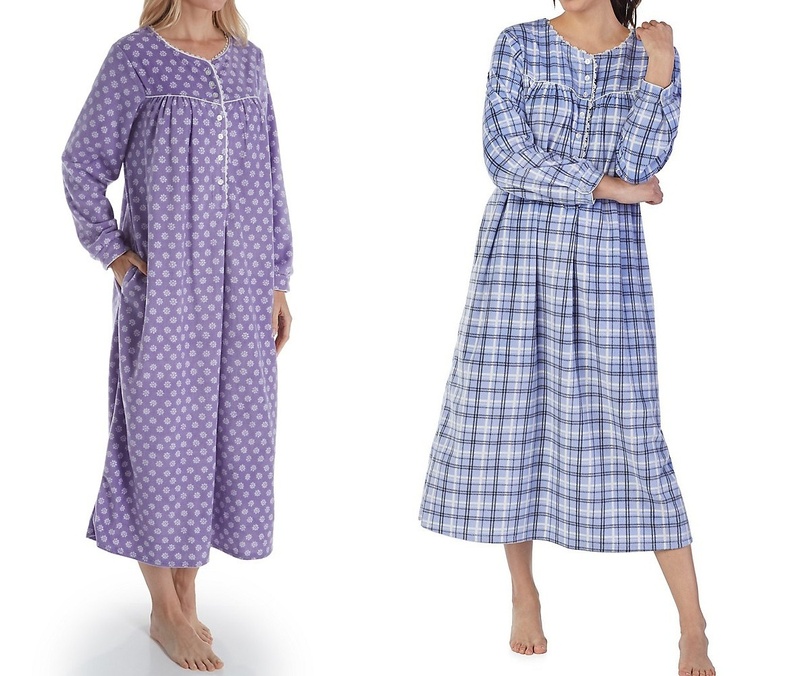 Flannel nightgowns, sleepshirts, and warm wear styles are one of the best sleepwear and loungewear choices that will keep you toasty warm throughout the winter months. Tip – for more luxurious sleepwear styling, consider nightgowns with delightful details like lace or eyelet trim and or satin piping.